HP ProDesk 400 G4 Desktops are the perfect affordable business PC solution for Small to Medium Size Businesses (SMBs) seeking a highly customizable desktop at a great price, without sacrificing performance! Powered by the latest and greatest in business computing technology the HP ProDesk 400 G4 Series Desktops come with Intel Core i5 3.4GHz processors, DDR4 memory upgradeable to 64GB on select models, and solid state drive as well as SATA storage options to choose from. In addition, the HP ProDesk 400 G4 desktop come with the latest in HP security and management features such as HP BIOSphere, Secure Erase, HP DriveLock, HP Recovery Manager, and Measured Boost for Windows operating systems version 8.1 or higher. Aventis Systems is proud to offer all of our HP ProDesk 400 G4 Desktops with a standard 1 Year Essentials Warranty with upgrades available to Express expedited parts replacement, Extended term, and Secure Drive media retention Warranties. 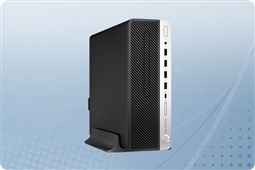 So shop our small form factor and tower models below to bring the best in affordable business performance to your company today with the HP ProDesk 400 G4!